"Assyrtikos (PDO) is a young, dry white wine, made from selected grapes of the 'Assyrtiko' variety grown with special care in the personal vineyard of the Koutsoyannopoulos family in Vothonas. 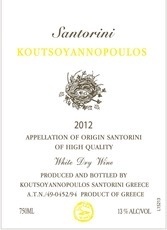 This variety has thrived in Santorini for 3,500 years. This wine is produced from 'free-run' juice, a juice that flows freely from the grapes before they are pressed. This technique helps the wine to preserve the freshness and aromas of the fruit. It is a high quality fresh fruity wine, because it is bottled on the fifth month of its lifecycle which also helps to preserve the freshness and aromas of the fruit."